As I get older I am more and more a fan of experiences and trying something new whenever I can. 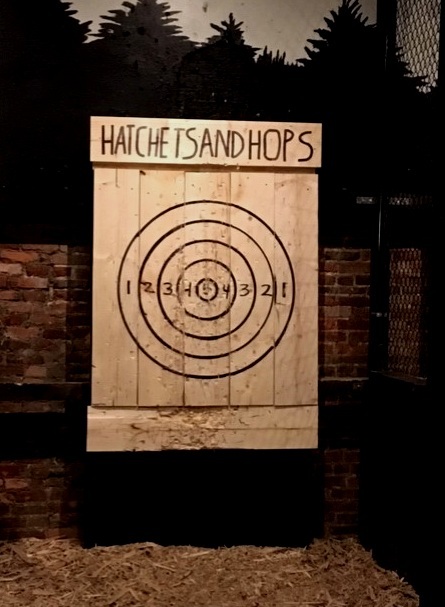 I have had on my (long) bucket list to visit and experience Hatchet and Hops when it opened over two years ago, so as a Christmas gift this year I decided I would book a Hatchets and Hops outing for my family and I. A few weeks ago we made it to 505 Main St. (located downtown near the Hyatt) and had a pretty cool experience. For $40 a person and guaranteed two hours of ax throwing we went head to head with some family members and some strangers to see who could win that free drink from the bar and more importantly gloat about being the best ax thrower in the group (note - I did not win that title). Jake was our instructor and score keeper for the duration of the outing, teaching us the scoring system, how to hold and throw the ax and answering any questions we may have had. You can host group parties, sign up for the weekly ax throwing league or simply go and cheer on your friends and/or family. It would even make a good team building or bonding experience for you and your co-workers. Overall the experience was unique, fun and memorable which are three things I always hope to get out of trying new things.